With their stinging tentacles, sea anemones seem an unlikely meal choice for most ocean-dwelling creatures. However, the anemone does have several natural predators with a variety of unique methods of snacking on the anemone, tentacles and all. Several types of snails and sea slugs make meals out of anemones and are able to eat both the body and the tentacles by advancing on the anemone several times despite being stung and then taking bites out of their prey. A larger anemone may be able to detach and float away, leaving the slug with only a few bites of tentacle to snack on, but a small anemone could be eaten whole. Sea stars such as the leather star prey on anemones by seeking them out with a keen sense of smell. 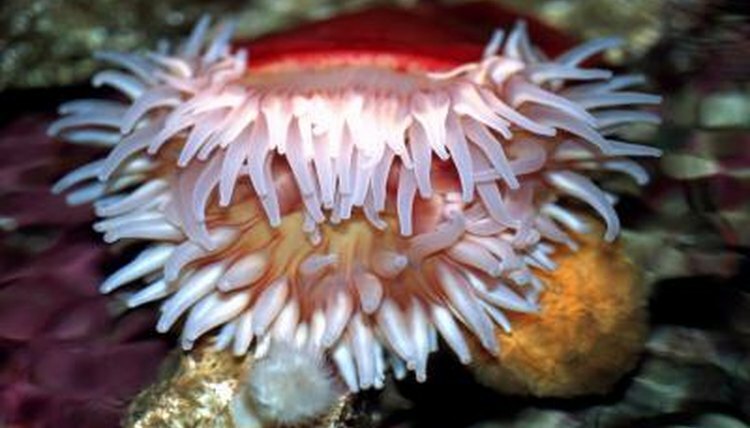 The star will wrap itself around the anemone and release its stomach around the prey, at which point digestive enzymes begin to break down the anemone's flesh. Multiple types of fish will munch on an anemone's tentacles, including butterfly fish and mosshead sculpins, with at least 40 percent of the mosshead sculpin's diet consisting of anemones. These fish feed by pecking at and taking bites out of the tentacles, rather than attempting to swallow the anemone whole. Anemones may survive these attacks and heal over where the bites occurred. The loggerhead turtle, a sea turtle found in every ocean except the Arctic, counts the anemone among its extensive list of prey. Loggerheads observed moving through Australian waters consumed anemones as one of their main sources of food; they eat them by using powerful jaws to bite and quickly crush their prey.